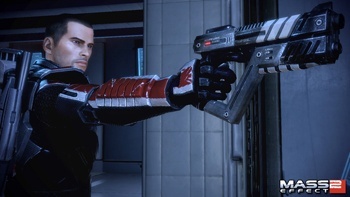 BioWare has shot down rumors that a PlayStation 3 version of Mass Effect 2 is on the way, saying that the PS3 code found in the PC version of the game is nothing more than a remnant of the cross-platform Unreal Engine. Neither Mass Effect game has appeared on the PlayStation 3, but BioWare has consistently refused to deny that it won't someday bring the franchise to Sony's platform. Could this be the reason? Did Kikoo uncover BioWare's greatest secret: Mass Effect 2 on the PS3? Well, no. In a short-and-sweet forum post, BioWare Community Coordinator Chris Priestly wrote, "The Unreal Engine is cross platform, hence the PS3 code. This was brought up back in Mass Effect 1 days as well. Mass Effect is for the PC and Xbox 360." Sorry, PS3 crew, but it looks like you're going to have to wait awhile longer.